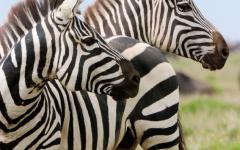 Customized for 2019-2020, take an extraordinary journey across Botswana’s unique and hidden treasures. 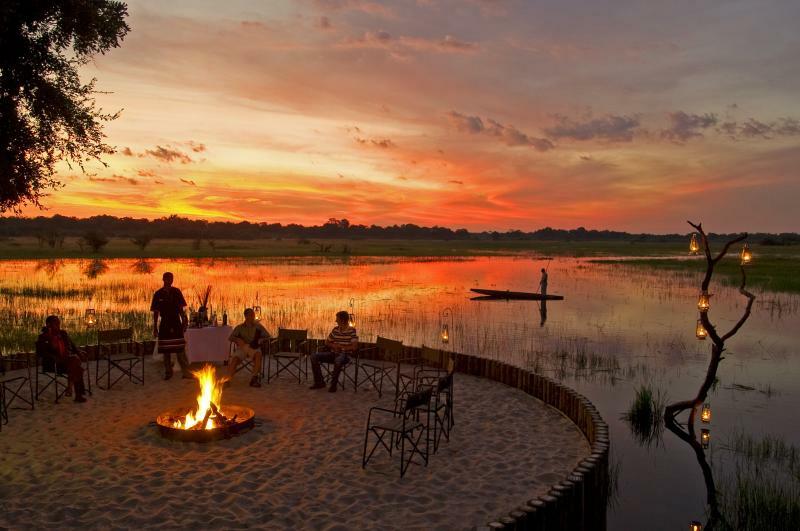 From the breath-taking splendor of the Okavango Delta - seen by air, water and land- to the heart of the world’s true wildlife Eden in the Moremi Game Reserve, to the great winding river of Chobe, this is a trip that will stay in your heart for a lifetime. Hands-on interaction with semi-wild elephants, thrilling game-drives, peaceful mokoro rides and luxurious spa pampering are just some of the treats in store. Prepare yourself for Paradise. 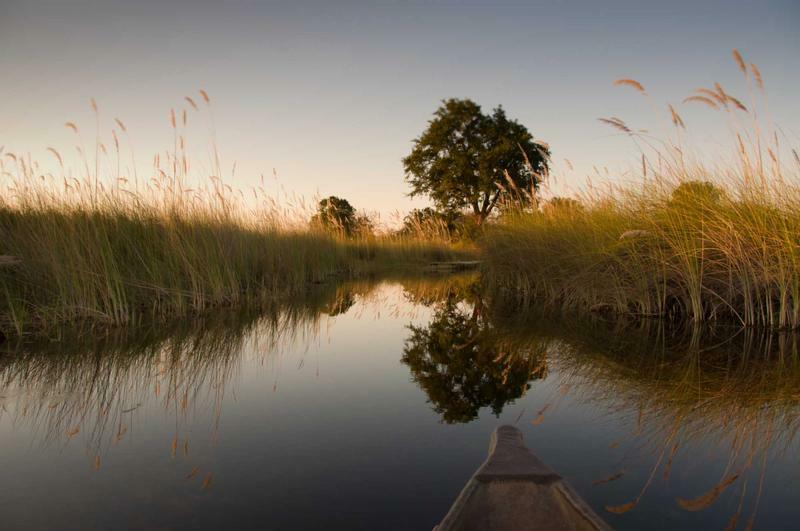 Float through the clouds from Maun to wilderness, and glance below to view the channels of this breath-taking oasis, the Okavango Delta, lapping up the surrounding desert. Glide through its waters by mokoro, keeping your eyes peeled for hidden jewels: perhaps a malachite kingfisher, or beady-eyed croc. Spend two magical nights at Baines’ Camp, a lodge whose uniquely larger-than-life hosts meet you on your first morning. Be ready for a trunk-shake rather than handshake, before Jabu, Thembi and Marula guide you through their home to where they feed or take glorious mud-baths. 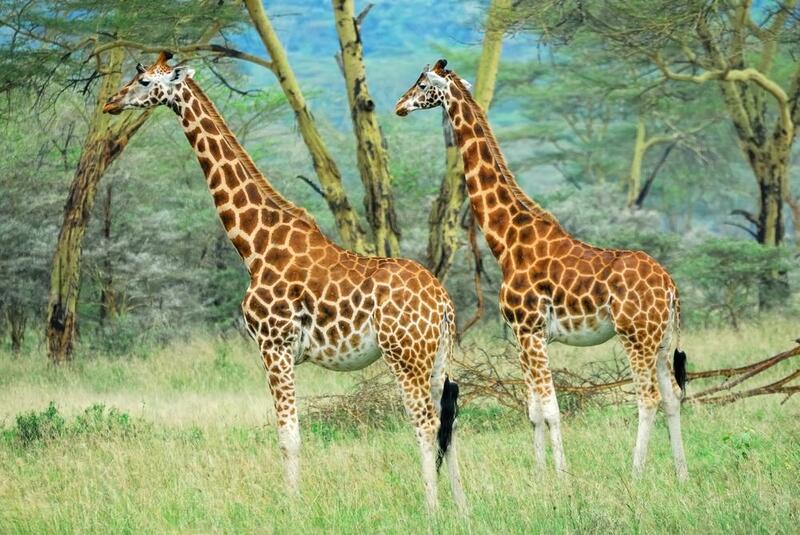 Enjoy a picnic lunch in the company of these gentle giants as they meander through their natural environment. Surrounded by the clear waters of the Okavango is Chief’s Camp, your next stop for three nights and the perfect location for your Botswana safari adventure in search of lion, leopard and wild dog. These and many other treats lie in wait for your camera lens. If that epic photograph still eludes you, or if you thirst for a truly unforgettable experience, why not charter the best seat in the house? Glide over Chief’s Island by helicopter, hovering meters from the flickering ears of a hippo, swooping effortlessly over areas of the Delta unreachable by vehicle. The doors of the chopper can be removed at your wish, allowing for a view that will leave you speechless. 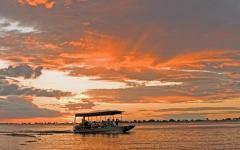 After the exhilaration of the Delta, head north-east to another of Botswana’s wildlife havens: Chobe National Park. 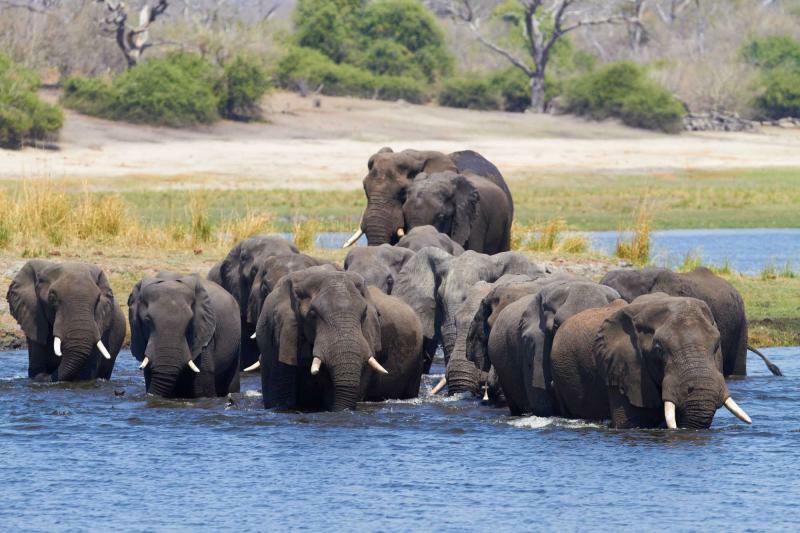 Named for its great river, this is home to the world’s largest remaining population of elephants, and is an idyllic setting for game drives and river excursions. Watch elephants crossing the river at sunset as you sip on a gin and tonic; revitalize with a spa treatment in between activities, and let someone massage those ‘bushed’ muscles into dreamy oblivion as the sounds of the wilderness lull you to sleep. 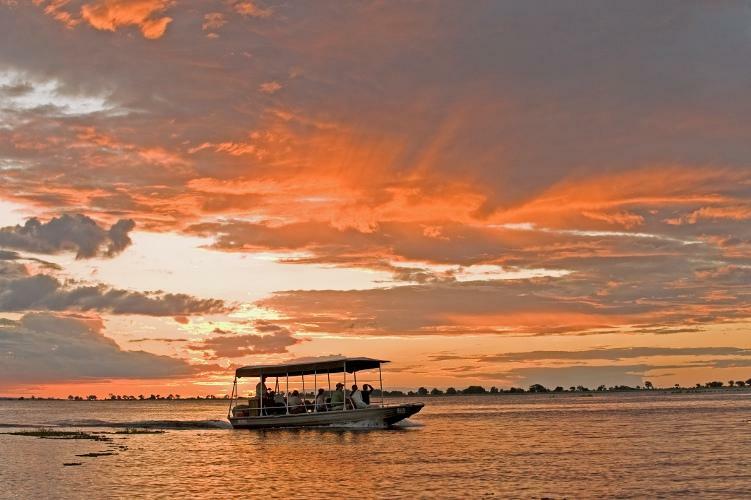 On your departure, the Chobe River will see you on your way to Livingstone, Zambia, as you travel by ferry from one beautiful slice of Africa to the next. On arrival at Maun Airport, you will be welcomed and assisted to your aircraft to Baines' Camp. 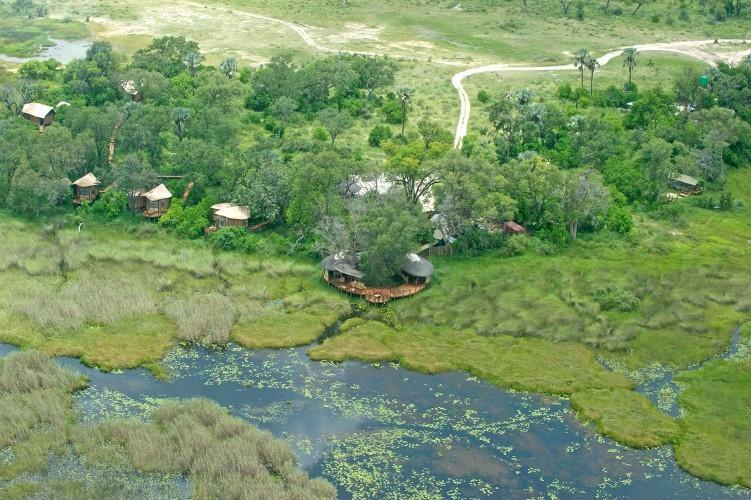 As you fly over the Okavango, you will witness the merging of desert with delta, and the magic of this beautiful oasis will begin to take hold of you. Caught between two geological fault lines, this area of watery paradise occurs as a phenomenon in amongst the parched sands of the Kalahari Desert. It has created an area of unrivalled beauty, and as you approach your first destination, look out for elephant, giraffe and zebra that have made this place their home. You will be greeted at the airstrip by your guide, who will take you to Baines’ Camp, your home for the next two nights. 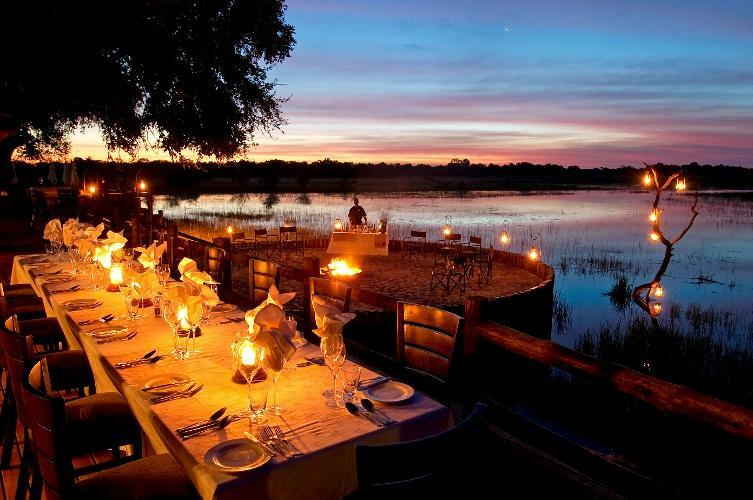 Situated on a private concession neighboring the Moremi Game Reserve, Baines’ is a unique and charming retreat that perfectly echoes its sublime location. Nestled in a small forest, and set on all sides by papyrus, Baines’ is raised off the ground along wooden boardwalks and it executes perfectly the balance between pure luxury and a conservation ethic. Its owners announce proudly that their ecological initiatives have quite literally formed the backbone of the lodge itself. The local community of Maun was encouraged to collect tin cans which were bought by Baines’ for a small fee and used to form part of the lodge structure. As well as reclining under the stars in the stunning sky beds, or pampering yourself with a candle-lit bubble-bath on your private deck, you can embark on game-drives and bush walks with an expert guide. Mokoro trips through the intricate channels of the Delta reveal some of the true gems of this wetland area: from egrets, herons and kingfishers to bathing hippo, crocodiles and red lechwe. Due to its location on a private concession, Baines’ also offers night drives, which add another fascinating dimension to your experience. On top of all of this, is Baines’ extra special (rather large) treat. As you lay back in your cozy bed on the first night, you may look forward to a morning’s adventure that is almost entirely unique to this lodge: hands-on interaction with its resident elephants. 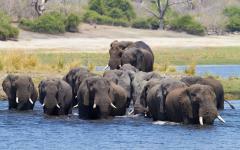 This morning you will meet the stars of Baines’ Camp: three semi-habituated elephants named Jabu, Thembi and Marula. 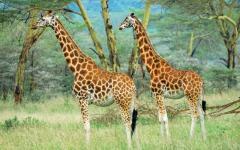 These gentle giants were orphaned as babies and adopted by the doting and besotted Sandi and Doug Groves. Jabu (the bull of the trio) and Thembi (the younger female) lost their families in the Kruger National Park in 1988 and were rescued by Doug, who together with Sandi has worked hard to ensure the continued well-being and personal development of all three of the elephants in the wake of their early trauma. The remaining female, Marula, was orphaned in Zimbabwe and since being taken in by Doug, she has found her feet as a confident and kind-hearted member of this little family. As elephants can live for up to 70 years, Doug and Sandi knew from the beginning that this was to be a lifelong commitment, and they love nothing more than to promote the welfare of these and other African elephants by inviting guests to witness their magnificence in their natural environment. Let Jabu, Thembi and Marula take you into their world on a morning bush walk and teach you how to strip tasty leaves from their branches, wallow in the choicest pools of sticky Delta mud and cool off with a dust-bath in the shade. See up-close their beautiful long eyelashes and feel the silky soft skin behind their ears; watch their trunks snake around a stubborn root and pull it effortlessly from the ground; walk alongside them and notice their cushioned feet, their soundless progress belying their mammoth size. It is an experience quite unlike any other, to see at such intimately close quarters, the habits and behavior of one of nature’s most beautiful characters. You can even enjoy your lunch in their company, with a specially-made picnic out in the bush: just keep an eye on your apples and oranges as a sneaky trunk or two might whisk them out of sight! For your final morning at Baines’ Camp, perhaps opt for a boat trip (mokoro or motorized boat) to enjoy the spectacular views from the water or a game drive to soak up a little more of the stunning terrain in this area. If you feel like a lie-in, let someone bring you breakfast in your room while you simply enjoy the view of the surrounding water from your bed. 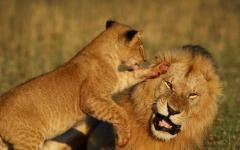 With time to fit in an activity, chill out or enjoy one more outdoor bush bath, the morning is yours. 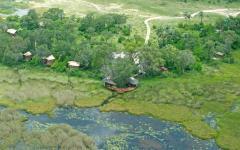 After brunch you will be taken to the airstrip where you will embark on a short flight to the next lodge. Chief’s Camp is your next destination. In the heart of the Moremi Game Reserve, this is a wildlife-lover’s true retreat, an Eden that holds many secrets awaiting you and your guide. Named after Chief Moremi of the BaTawana tribe, this reserve rests on the eastern side of the Okavango Delta. 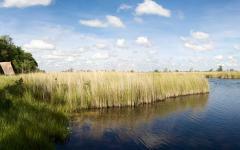 The terrain combines permanent water with drier areas, allowing for startling and unexpected contrasts that have attracted hugely diverse bird and mammal life to the area. From sprawling savannah, to shady lagoons, to thick woodland, there is often an overwhelming sense of life to be found here, and it’s often tricky to know where to point your camera lens! 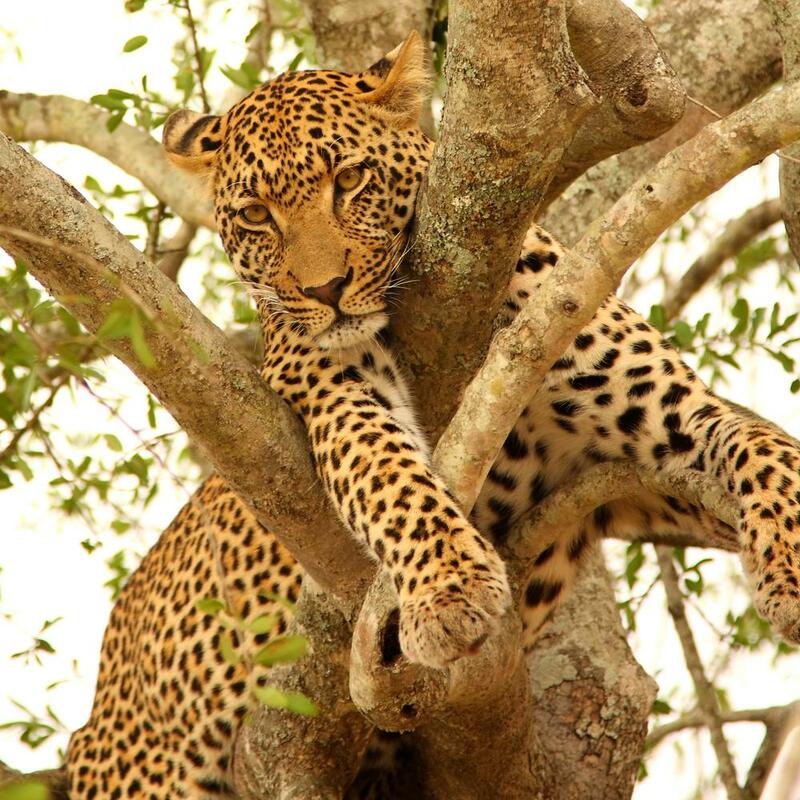 During your stay you can explore mopane and acacia forests, floodplains and pans, traverse across trickling channels and bask amongst swaying palm trees. The main deck of Chief’s Camp offers you a gorgeous view of the Piajio plains, and the outdoor dining area looks out across this stunning wilderness. Your guide will wake you at dawn, with time for a quick bite before bundling you into the vehicle to begin the search for game. Keep those sleepy eyes open to spot browsing kudu, or prowling hyena returning from a night hunt, and watch a troop of baboon chasing one another through the trees. You can stop for a mid-morning coffee or tea before leaping back into the vehicle as the sound of monkeys alarm-calling in a nearby tree alerts you to a nearby predator. 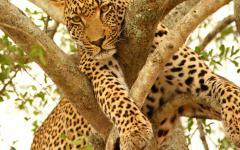 Around the corner there may lie a leopard reclining in a fig tree, or a lazy pride of lions sleeping off fat tummies. 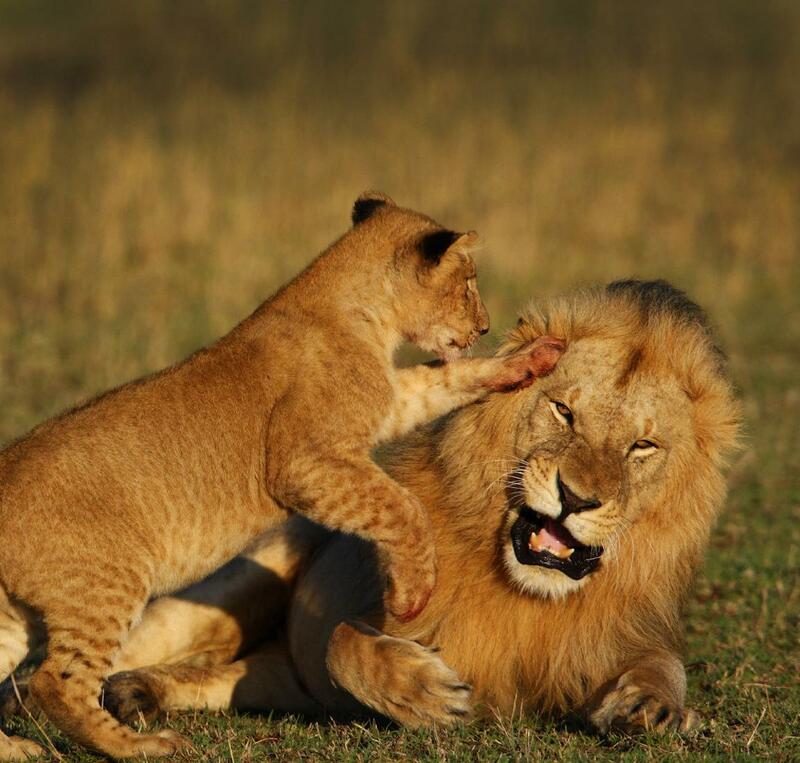 After a delicious lunch back at the lodge, and a well-deserved siesta, or a refreshing dip in the pool, you can embark on an afternoon game drive, in search of cats on the hunt or even a pack of wild dogs in search of their dinner. Over the next few days your guide will accompany you on an unforgettable journey in search of these and many other exciting encounters with various species like buffalo, giraffe, cheetah, jackal, impala and elephant. Even for the most experienced traveler, there are always new and unexpected insights to be gained on a trip through this truly wild territory. If you really want to take it to another level, your hosts at the lodge can organize a chartered helicopter scenic flight for you: take 45 minutes or an hour and soar over Chief’s Island to see areas that can only be enjoyed from the air as they are unreachable by vehicle. There is an option to remove the doors of the helicopter, affording you an uninhibited view whilst you are safely strapped to your seat, with only the concern of how to hold your camera still! The beauty of this type of flight is how close to the ground you may fly before climbing higher to attain that spectacular bird’s eye view of the scene. With a headset on, the pilot can point out animals and explain the great contrasts of dry, parched land with glossy, deep channels that you will be able to see clearer from the sky than from the vantage point of a vehicle. After your journey through the Delta, another contrasting paradise awaits you. After a final game drive at Chief’s Camp, you will fly to Kasane to be driven onwards to your final Botswana camp, Chobe Chilwero. As luxurious and comforting as it is authentic, this lodge will gather you up in its embrace as you immerse yourself in the charisma and charm of Chobe. Botswana’s first National Park, this territory lies north-east of the Delta, and was originally home to the San bushmen (also known as the Basarwa people in Botswana). These were nomadic hunter-gatherers, whose paintings can still be found in amongst the rocky hills of the park. Echoing the first few days of your Botswana adventures, this part of the country will bring you once again into the company of that gracious grey giant, the elephant. The park is widely known for its spectacular elephant population estimated at about 50,000; this is thought to be the highest concentration in Africa. Chobe Chilwero itself is situated on a ridge overlooking the Chobe River in the distance, one of four great rivers in Botswana. Walking out onto your deck, you will be greeted by unparalleled panoramic views as far as Namibia. An absolute must-do here is a river cruise at sunset to see the family pods of hippo, and glimpse a herd of elephants crossing the water at sunset. 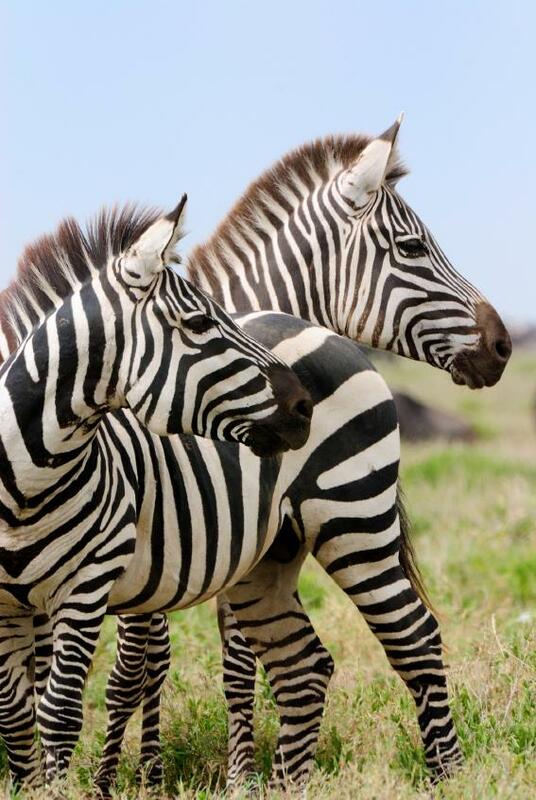 For those who haven’t quite satisfied their wildlife cravings, there are more morning and afternoon game drives to be enjoyed, and for those who need to wind down and really relax, there is a treat in store. The spa at Chobe Chilwero is one of the best on offer across Botswana’s safari lodges, and invites you for tree-top treatments in the midst of Chobe’s rustic bush surroundings. After experiencing several days of the ‘bush massage’ on board those bouncing vehicles, lie back and let one of the skilled therapists get at those muscles so that you can truly unwind and soak up your sumptuous surroundings. In the evenings, indulge in gourmet fare accompanied by delicious wines, and look back on some of the highlights of your trip whilst the sounds of the African wilderness and its residents lull you cozily towards the welcome comfort of your bed. Combining real pampering with the ever-tempting excitements of the bush, Chobe Chilwero is the perfect place to end your sojourn through the ethereal splendor of Botswana’s wilderness. After one last game drive, or one last massage, and a glorious breakfast, a ferry awaits to carry you onwards. On the other side of this last crossing lies Livingstone, Zambia. 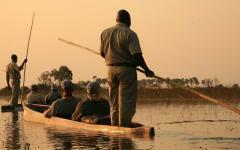 See what other travelers had to say about their trip in the Botswana safari reviews section. "In one word - AWESOME!" "It was a trip of a lifetime and our travel agent did an amazing job, with spot on suggestions."